Regular readers would know that despite its isolation Kookynie is a social bouillon of new ideas and trend-setting. The foodie movement has not passed us by, au contraire. Exciting additions to the pub’s menu board are showing the way: for example, a dish with fried meat and breadcrumbs called schnitzel, which can be either beef or chicken. And it uses stale bread bits to make the crumbs, which dovetails nicely with our sustainability ethos. Recently, the Council elders thought of getting a celebrity chef here for a stint of cooking in our renoed kitchen, to inspire other new outback dishes. And maybe put Kookynie on the gastronomic mappemonde. Notice how foreign words add savoir-faire (sorry!) to this story. An alphabetical world cuisine listing would also put us in front of Korea too – clever marketing! The search for an inspirational chef produced a shortlist with Perry, Bourdain, Adria, Ottolenghi and Oliver. They were all keen to come, but finally, out of sympathy for the Poms over losing the cricket again, we settled on Jamie. Travel was booked and a room reserved at our historic hotel, which unfortunately has no ensuite bathrooms. He was cool with that. The town population was in a state of high excitement, all six of us. Well, actually some of this story is more the figment of an over-active imagination. But we did manage to acquire some of Oliver’s spirit with the arrival of his herb cutter, now affectionately known as Jamie. As in, could you please pass me Jamie, when you have some saltbush or dried quandongs to prepare. 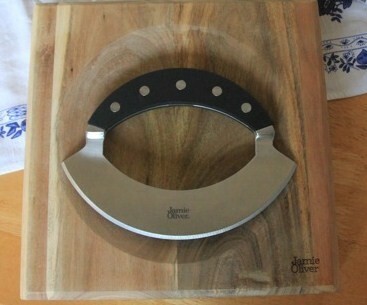 He is definitely cutting-edge and a welcome addition to our model outback kitchen. It’s a mezzaluna! You should have invited Nigella, it’s her favourite kitchen tool. Also a very male orientated list of guest chefs, Peter! A list for future guests; Anne Sophie Pic, Angela Hartnett, Helene Darroze and maybe Nigella? Thanks a lot, Susie. You’re right of course, a definite gender bias, but Nigella would be very welcome here. She’s probably happy to get out of the spotlight for a while too! And mezzaluna certainly sounds sexier than herb cutter. She probably used the mezzaluna to cut up her cocaine!